Are we here already? I mean, really? Seriously?!?! It feels like yesterday we were just settling in for the interminable tennis offseason. We were trying desperately to figure out how we would spend all that free time now that there weren't pivotal second round clashes from some far-flung outpost of tennisland to hold our attention. Well, the reality is, we didn't even have enough time to build a decent Spotify playlist before they were at it again. Here's what we saw this first (official) week of the 2012 season. Rafael Nadal, Roger Federer and Andy Murray were in action on the ATP Tour this week with varying results. 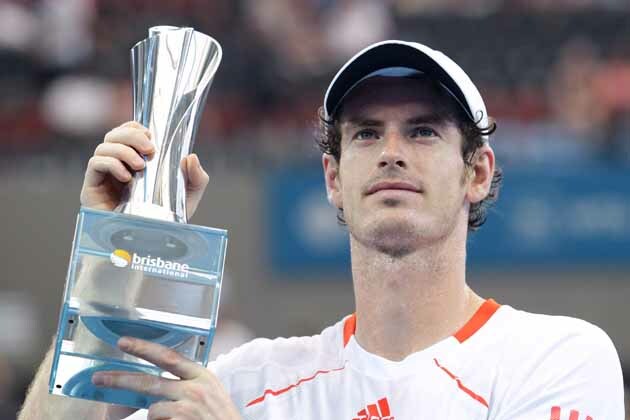 Murray would be the only one of the three to claim a title in this first week of the new season. The Pride of Scotland captured the Brisbane International with his new coach Ivan Lendl on the sidelines by the end of the week. Count us in the camp who isn't sure what Lendl will (or is expected to) bring to the table for Murray. Yes, the Czech-born American is clearly among the all-time greats as a player with his eight major titles (coincidentally that's fewer than either Federer or Nadal have won), but his triumphs were largely based on consistency and physicality. Well, Murray's best weapon is already arguably his consistency (if not his variety), plus Brad Gilbert boosted Murray by leaps and bounds in terms of physicality when they worked together earlier in the Scot's career. So what exactly is Lendl meant to impart? There's always the kinship factor; Lendl certainly understands the pressure Murray is under, as he himself spent years as an "almost" major champion dropping four major finals before breaking through in a 1984 Roland Garros final that John McEnroe still isn't quite over. It seems as if Murray hired Lendl less to help him with his game and more to help him mentally get over the hump. In interviews, Murray continues to mention Lendl's experience versus anything tactical he thinks his new coach can help him with. That may just a canny interviewee playing his cards close to his Climacool; or it may indicate that (like that other Andy who once worked with Brad Gilbert and later hired a multiple major champion with no coaching pedigree as his coach), Murray's simply trying to figure out how to win against his great rivals rather than improve any aspect of the on-court performance. Lendl's influence, or lack thereof, notwithstanding, the (Almost) Great Scot put on a sparkling display against an admittedly injured Alexandr Dolgopolov to win the Brisbane final 6-1, 6-3. He didn't give an inch to his opponent, gliding across the court in an offensive and defensive masterclass that underscored both how well Murray was playing and how unfit Dolgopolov was to compete on the day. Knowing how often the healthy player plays down to their wounded competition, Murray's victory shows that at least his head is in the right place going into this season and that's often half the battle with him. Nadal and Federer finished with mixed results opening their seasons in Doha. Nadal certainly played better than he had in the last couple months of 2011 in reaching the Qatar ExxonMobil Open semifinals, but then he dropped a puzzling semifinal to Gael Monfils. Now, going in, if you're a Nadal watcher, you know these are not the tournaments the Spaniard tends to win. Nadal hasn't claimed a 250 since Queen's Club back in 2008 some eighteen titles ago; but the worrying part is how he lost. 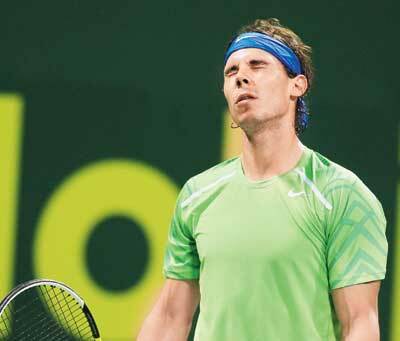 Down a set, but leading 4-1 in the second, Nadal watched stunned as Monfils reeled off five straight games to advance to the Doha final. Monfils, for his part, played spectacular tennis defending against the Nadal onslaught. That said, as Monfils is wont to do, he followed it up by fizzling in the following round. In any event, once unquestionably among the game's fiercest closers, Nadal's performance here did little to quiet the growing murmur that the Spaniard has lost his killer instinct. I would counter that the way he finished in Doha makes me think that Nadal feels he played well during the week, justified his appearance fee and mentally was already rolling his suitcase toward el aeropuerto after dumping that first set, no? Roger Federer similarly seemed to pull up stakes, making what can only be characterized at this point as a precautionary withdrawal after his back tightened up during the week. Among the elder statesmen of the ATP tour, we're giving Federer an unqualified pass for pulling the rip cord considering he's only pulled out of two matches in a career that should pass 1,000 tour level matches in Australia. Presumably feeling the effects of his injury during his scrappy, three set win over Andreas Seppi and knowing his goal is to be ready to go in Melbourne, quitting in Doha was the right call. All the while, ATP No. 1 and defending Australian Open champ Novak Djokovic will not play an official tourney until the Aussie, using his win at the exo in Abu Dhabi as his warmup for the upcoming Aussie Open. The third men's tourney of the week saw Canadian young gun Milos Raonic blasting his way past the surging Serb Janko Tipsarevic to win the Aircel Chennai Open this week 6-7 (4), 7-6(4), 7-6 (4). 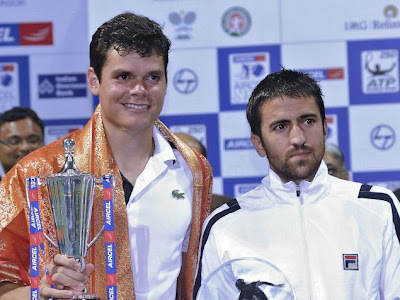 Don't cry for Tipsy though, he went on to win the doubles title a bit later partnering Leander Paes. The star power in the Indian event was dimmer than in Brisbane or Doha, but the result was no less important. Raonic's win should vault him back near his career high of World No. 25; but it also takes some pressure off as it in effect allows him to "defend" his points for winning the 250 in San Jose last year a few weeks early. 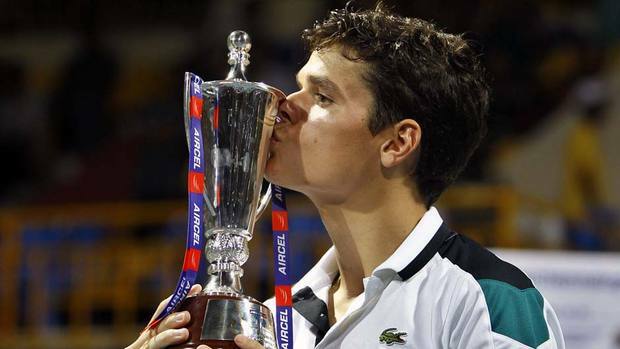 (In 2011, Raonic lost in Chennai qualifying). The bigger news in the grand scheme of things, is that it seems Raonic is healthy again and ready to re-boot his (hip-injury interrupted) ascent to the upper reaches of the ATP Tour. Tipsarevic goes one step further than in 2011 when he was a semifinalist in Chennai. He'll stay at No. 9 in the rankings, but it's clear that a month out of the fray did nothing to dull his game in reaching his fourth final since September. At this point in his career, one step forward for Tipsarevic is great news. Tipsarevic was the Australian Open junior champ back in 2001. Now 27, more than a decade later, he's finally bringing his best tennis to the big show. Keeping in mind Tipsarevic's career best finish in a major was the quarterfinals of last year's US Open; that one incremental step would put Tipsarevic in some heady company going into 2012. Only one big trophy, but dare I say, two winners, this week in Chennai. The women launched their season with two events. The low-wattage ASB Classic in Auckland was headlined by Sabine Lisicki and Shuai Peng. Peng was done by the second round, falling to Lucie Hradecka. While Lisicki had to pull out of her quarterfinal match due to what was ultimately determined to be an abdominal injury, continuing the star-crossed German's hard-luck narrative, as she missed most of 2010 with an ankle injury. It seemed somehow fitting that this tournament where Lisicki was the top seed would ultimately be decided by injury. Jie Zheng won the event when doubles specialist/tell-all writer Flavia Pennetta was felled by a back injury (she also lost the doubles final with partner Julia Goerges). The best storyline of the tournament was seeing notoriously up-and-down 19th ranked Russian Svetlana Kuznetsova getting all the way to the semifinals before falling to eventual champion Zheng. Granted, Auckland is a small tournament and Kuznetsova merely played to seed, but seeing as she only reached two semifinals in all of 2011; it could be a sign that Kuznetsova's pulled it all together to make one more run. One more run for the talented Russian before the power vacuum created by the retirement of Justine Henin is completely filled by the young-gunnettes like Hopman Cup winner Petra Kvitova. By contrast to sleepy Auckland, Brisbane's women's event launched with four major champions and four former World No. 1s in the field (Note: those groups are not mutually exclusive). Plenty of big names like Serena Williams, Kim Clijsters, Samantha Stosur, Francesca Schiavone, Ana Ivanovic and Jelena Jankovic opened the shooting match, but none of them made it to the finals. Much like in Auckland, injuries eliminated two major contenders, Williams and Clijsters, from the draw, though both seem on the road to playing in Melbourne. In the end, Estonia's Kaia Kanepi was the last woman standing, demolishing Slovakia's Daniela Hantuchova 6-1, 6-2 in the weekend's most lopsided final. Against Hantuchova, Kanepi punished the ball off both sides like the stars Brisbane's fans reasonably expected to contest this final. 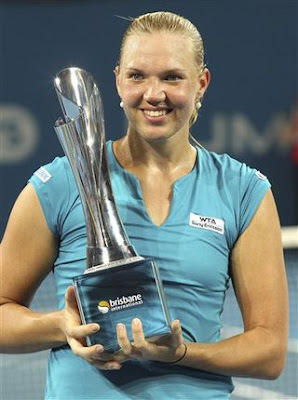 Much like Tipsarevic, 26-year old Kanepi was a junior champion, ranking No. 1, but she's only produced erratic results in the big show. Kanepi herself admits that she hasn't been consistent enough in recent years, but she's been a threat for sure. Despite not having anything approaching household name status, Kanepi has reached the quarterfinals of three majors. This week's title (only her second) boosted her WTA ranking from No. 34 to No. 26 this week. Her renewed focus plus her big game seems enough for Kanepi to contend week-in, week-out on the WTA Tour...if she can find her best tennis week in, week out, that is. So, going into one of the year's premier events, the top women are fighting injury while the top men are working themselves into fighting shape. There are newcomers and ex-sure shots looking for respect and redemption alike. We fans (at least in the Western hemisphere) are prepping for some long, sleepless winter nights. Like we said, didn't we just do this? Yeah, we don't mind either. Welcome back tennis. You didn't mention the winner in Doha - Tsonga is a surely a force to be reckoned with in Melbourne. Hmmm, save face and say that I'm planning on writing more about him later or admit to forgetting all about him with all the matches going on...? Little bit of both, Par3182; both statements are true. I think Tsonga is in an extremely interesting place going into this season. Stay tuned for more. Everyone wants to abrasion wig with aforementioned bloom and afterglow which they access from a anew bought wig. But unfortunately, your abounding applique wig may lose the burnish and bloom if you started cutting it. There are replica chanel added means for you to absorb your wig with aforementioned freshness. One a part of them is application baking soda while abrasion wigs. Try to besom your wig with a bit bead of baking soda. Baking soda will accomplish your wig attending too accustomed chanel outlet like your absolute hair afterwards abrasion it. Your prada replica wig will attending too sparkling if you adopt to use baking soda for abrasion and abrasion your applique wig. These applique foreground wigs appear with amazing wig hermes replica caps which accomplish you feel simple to abrasion it for any occasion. I feel gleeful after unearthing this post. I would like to tell that Rafael Nadal, Roger Federer, Andy Murray- are some of the greatest icons of tennis frolic of all time. They are continuously entertaining us by their athleticism. I personally consider them as the wonders of the tennis world. If you love sports and want to become a tennis superstar, then investing in a personal tennis court right away will be the smartest approach to advance the proceedings. If you already have your own tennis ground, then simply resurface it from time to time to make your practice session effective and to make the most out your playing yard. But if don't have, but you want to construct your own tennis ground, then speculate wisely to avoid the chances of facing of facing soreheads in future. No matter, whether it is a person tennis ground or a commercial one, maintenance undertakings must be carried out systematically to keep the court aesthetically attractive and safe for the physical sessions.